Food and Fuel America.com: Tennessee Governor Proclaims "Biofuels Day"
As millions prepare to celebrate their freedom this July Fourth, Governor Phil Bredesen is encouraging Tennesseans to kick off the pre-holiday weekend by celebrating independence with biofuels. Governor Bredesen has declared June 28th as the first ever Biofuels Day in Tennessee and announced his plan to get more Tennesseans to try clean, homegrown, renewable biofuels. 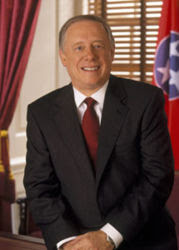 "I'm pleased to designate June 28th as Biofuels Day in Tennessee, said Governor Bredesen. In addition, I am encouraging fueling stations across the state to reduce their prices on ethanol and biodiesel for this special one-day event. Millions will be hitting the road this weekend for the July Fourth holiday and I want to invite all Tennesseans as well as those passing through our state to consider celebrating their independence with biofuels." In addition, TN now has a map of existing biofuels locations at www.biotenn.org.